Bulova 1955 La Petite "I"
I inherited a beautiful La Petite watch from my grandmother. It was given to me in its original box and in amazing condition. I cannot find any markings on the back of the watch case besides the serial to help me identify it, other than the La Petite 23 Jewels that is listed on the box, as well as the number 23 on the face. Inside, there are numbers etched into the back of the cover. The movement has several identifying codes, but I am not sure what they all mean. "L5" translates into 1955. However, I have not figured out which is the movement model and movement serial. There is "5AD" and "6ADJ". I absolutely love this watch and am so happy to have it. You cannot get anymore info from the watch unless it's opened. Any jewler is able to do that. Once open, document every stamped letter or symbol on the movement. Document any and all data from the inside the back cover. A photo of this data would be nice to have to help authenticate the watch, should you wish to sell it. I you ask what it's worth when the watch is opened & the jewler wants to buy the watch, you will get a lowball estimate. If it's worth big bucks, go to a proffesional appraiser for evaluation, unbeknown to the jewler & have the watch evaluated for market prices. Now you have two estimates and know the approximate value of the watch. Not in a million years is this 1938. I would think, with a 23j movement you are looking at 1955 onwards, possibly as early as 1951 but I wouldn't count on it. The box shouts late 1950's/early 60's to me. Can you photo the back of the case and the movement? Totally agree with Gary, more likely to be early to mid 1950s. If there is no date stamp on the back case then its more likely early 50s. Having a jeweler open the case and looking for the date code on the movement should help. We inspected the inside and figured out it was around 1955. The 1938 derived from advertising research that was done. There is a similar piece from 1938. The diamond watch band was added later, likely to replace the original black band. The code on the outer case is 515756. Inner identifiers were: L5, 5AD, and 6ADJ. Not sure what to make of those. But the L5 points to 1955. 5AD is the movement model and 6ADJ is the number of adjusts the watch was given. 6 means it was tested and adjusted in 6 different positions. Read more about it here. I'm not sure we see the La Petite advertised before 1956. 1955 isn't too early for an example. The L5 on the movement has been confirmed, however there is no date symbol given for the case. Looks like the jewel count is also inferred from the dial and box- not from movement. I'm betting, if this is La Petite, the case may date to 1956, and Bulova used a L5 movement?? Ranfft lists 5AD in 21 and 23 jewels, with start date of 1952, however it's not apparent when the 23 jewel version came about. 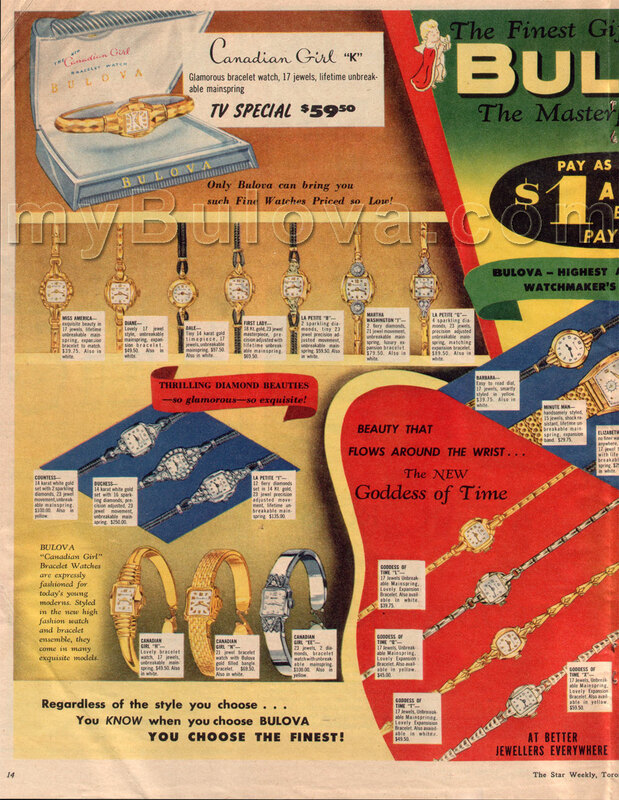 His example (fig 1) shows a 1955 5AD w/ 21 jewels. Fig 2 example is 1960 23 jewels, but we have confirmed examples of 23 jewel 5AD in our watch database beginning 1958. If all La Petite were 23 jewels, and began 1955/56- then this may be our earliest example. PM sent to confirm jewel count for movement. Not the subject, but this 1955 ad has a couple of La Petites.